I’ve been known to travel a good, long distance for a haircut. Especially with curly hair, I consider it a worthwhile investment in my own personal happiness to get a class-act cut. Every time I travel to the US, I scope out salon reviews in advance to locate curly-friendly stylists within driving distance of my destination. Last year, over the Christmas holidays, I drove 1.5 hours outside of Orlando to just such a salon. My father was horrified. And I still threaten Pappa P that I’m going to make a special return trip to our wedding site in Amalfi, Italy just to get my hair cut again by the fabulous-o Andrea. Totally worth it, in my opinion. 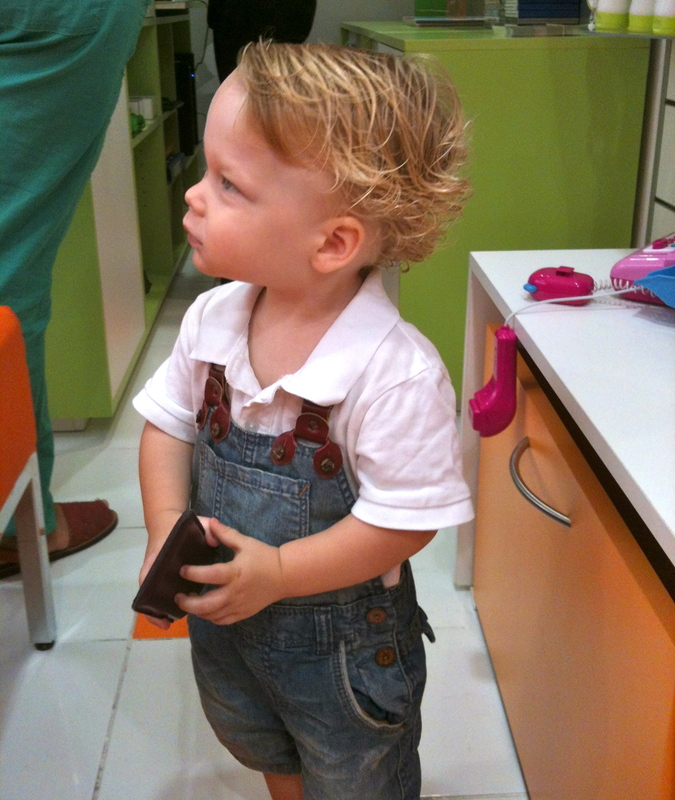 So not just any hair salon will do for my little one, no sir! 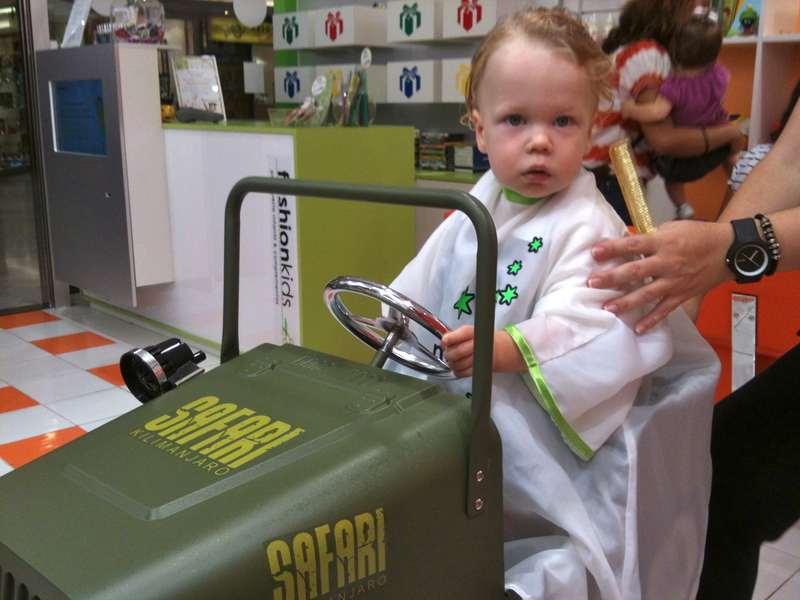 Cars and trucks and toys and songs and films…. oh my! With so many distractions, my typically-restless little boy was completely struck dumb. 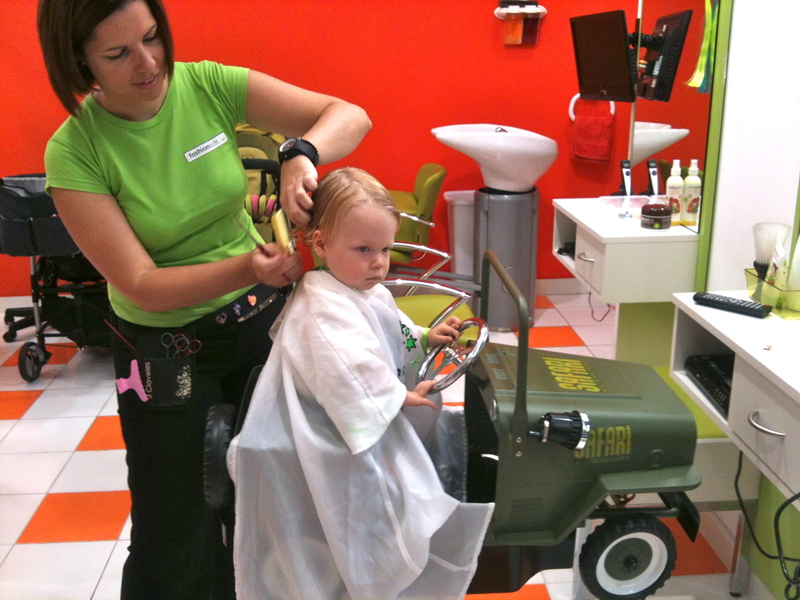 He sat quietly in his green army truck “salon chair” for the entire ten minutes of the haircut. This is approximately 7 minutes longer than he’s ever sat anywhere since he started walking five months ago. Curly locks still in full force = a happy mommy and a content little boy! This entry was posted in Children, Motherhood and tagged Children, children's hair, hair cut by Prosecco & Pampers. Bookmark the permalink. He still have some curls left…..Jippiii keep them to farmor is coming….